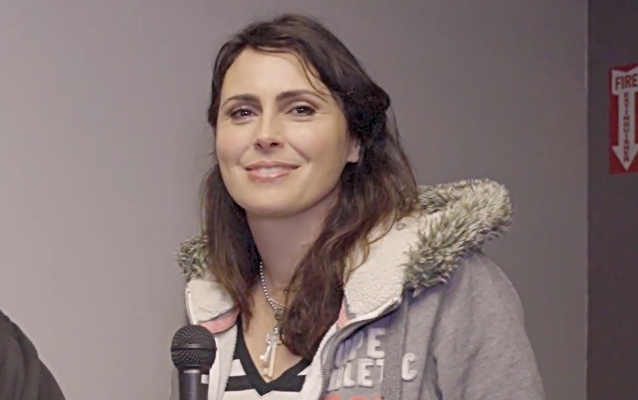 Prior to WITHIN TEMPTATION's performance in New York City on March 2, vocalist Sharon Den Adel spoke with Keefy of Ghost Cult magazine. The full conversation can be viewed below. A few excerpts follow (as transcribed by BLABBERMOUTH.NET). Sharon: "When we started to write again after [2014's] 'Hydra', I had writer's block — not just me, but the rest of the band as well. We knew what we wanted to do, but we didn't know how to get there, because it was a different sound that we were looking for, and it was a little bit too far away from WITHIN TEMPTATION – how everybody else knows us since 'Hydra'. We wanted to sound a little bit more modern, so we needed a different kind of production, different directions to go to. It took us some time, but we finally did find ways to implement some new stuff in our music and still stay WITHIN TEMPTATION." Sharon: "First of all, you make music for yourself... People fall in love with the first record they hear from you. It can be any album since we started. Everybody has a different album they like most, and people don't like change, generally. But for us, it's essential to make new music. We want to have change. We're not one of those bands who wants to do the same [thing] for many years." Sharon: "We always look at the song, because that's the most important to us. You write a song and then you figure out later how you're going to fill it in. You look for a person that suits the song." Sharon: "We're looking always at the songs and what has changed [production-wise], because every time we bring out an album, it's four years later and there's new technology, there's [a] new way of doing things, and we've learned also in that time new things. That's what you try to implement every time when you start a new album." Sharon: "Almost immediately after MY INDIGO, I started writing for the 'Resist' album. It is a very different album — different, I think, [because] this album was a little bit more political in some ways, and MY INDIGO is not. It's totally personal. But there are also some personal songs on this album that could have some overlap with MY INDIGO." Sharon: "After the summer, we're going to write some new stuff again, probably... We want to start writing very soon again, because we have a good flow going on, so we want to try to keep it up." Sharon: "It's pretty hard, actually. Yesterday, I played Philly, and my voice dropped out halfway [through] the show. I couldn't sing any low notes anymore, but I could sing the operatic stuff. The things that I needed my low voice for, my more speaking kind of voice, it was very difficult. Today, I'm a little bit hoarse still, but it's going to be fine, I think... It's all due to, you know, you have the jet lag, and then the day after you've arrived, you immediately have a show, so maybe it was a bit of tight scheduling of everything in combination with this kind of [cold] weather. It's the first time we're touring here in this kind of weather. Every time we came here, it was beautiful weather. Next time, we're going to be touring a little bit later in the year, I think. [Laughs]"
Sharon: "Not yet. I know it's been  years, but somehow, it doesn't feel like that, so maybe when we're fed up with writing new songs, we're going to do a tour of [2004's] 'The Silent Force' or 'Mother Earth'. You never know. I'm not promising anything. It's not like the whole album was that great. Certain songs were great... I like certain songs from every album, but there are also some songs that I felt like, 'Oh, I wish I'd never written [that].' Those things happen, but for other people, those are songs that they really like, and they don't like the ones that I like." "Resist" was released on February 1. It is WITHIN TEMPTATION's first release through Spinefarm Records, the specialist hard rock label of Universal Music Group.